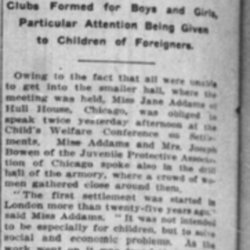 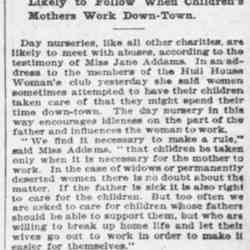 Subject is exactly "child welfare"
Addams addresses the Second Congressional District of Illinois asks Chicago woman's clubs to establish a scholarship for children of widows. 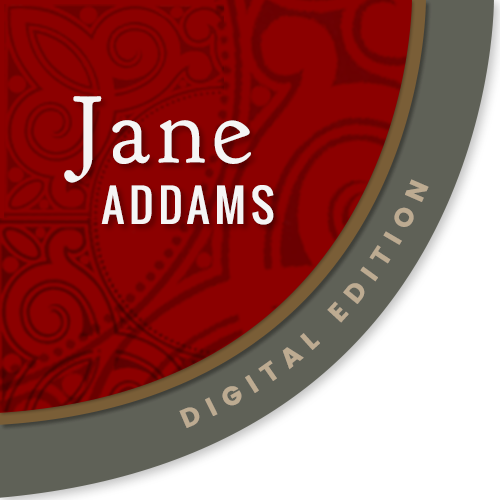 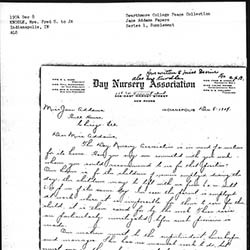 Knodle asks Addams' advice on anyone suitable to work as a matron for the Indianapolis Day Nursery Association. 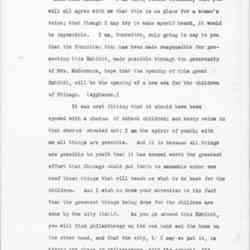 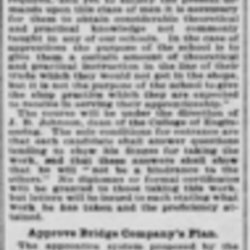 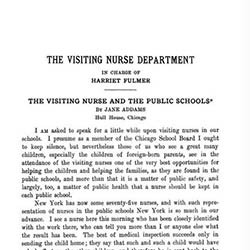 Addams' address to the Conference of Visiting Nurses discusses a program in Chicago that helps keep children in school. 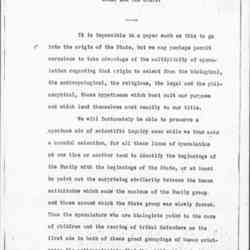 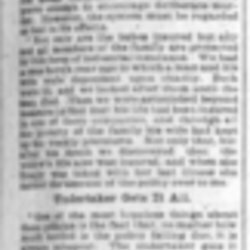 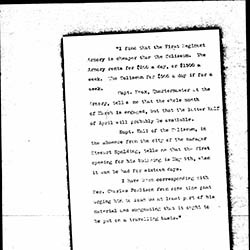 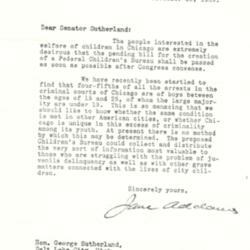 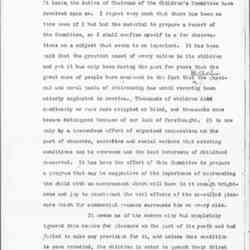 Addams seeks Senator Sutherland's support for the establishment of a Federal Children's Bureau, arguing that it would allow the gathering of information currently not possible. 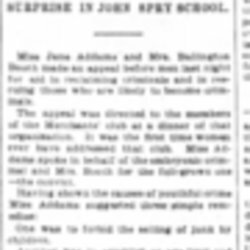 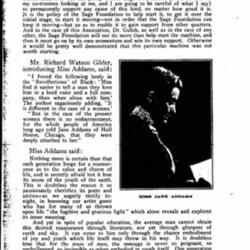 Addams gave this lecture at least two times; once at the February 2 meeting of the New York City Women's Political Union, and again on February 14 at the Boston School Voters' League. 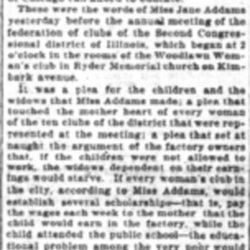 In the lecture, she discusses the philosophical relationship between women and the State and argues for the value of women in government, leading to the importance of woman suffrage. 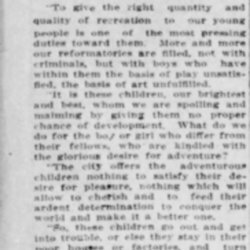 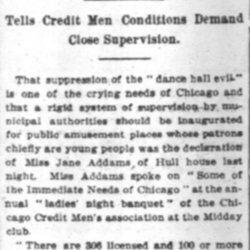 Addams compares costs and logistics of hosting the Chicago Child Welfare Exhibit at the Armory or the Coliseum. 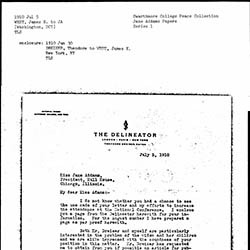 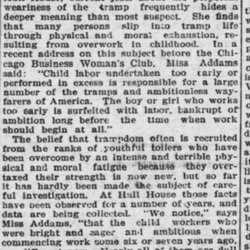 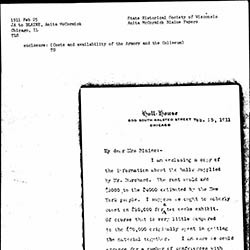 Addams writes Blaine about the financial costs of bringing the Child Welfare Exhibit from New York and expanding it for Chicago. 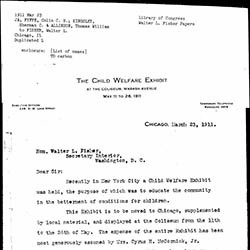 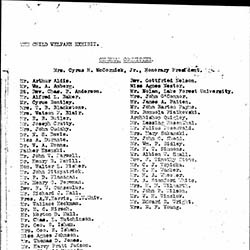 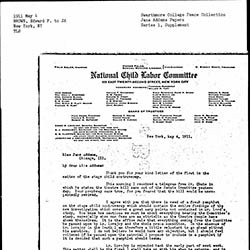 Addams and other executive members of the Chicago Child Welfare Exhibit invite Fisher to join the General Committee in support of the event. 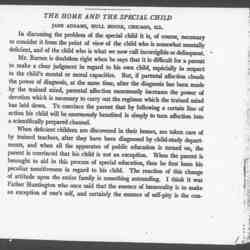 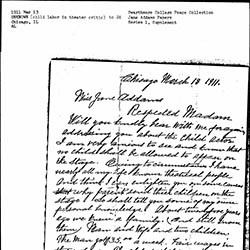 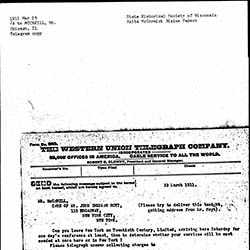 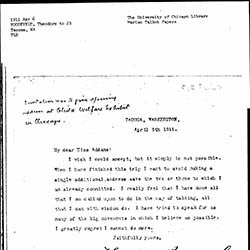 Addams invites McCahill to come to Chicago for a meeting about the Child Welfare Exhibit. 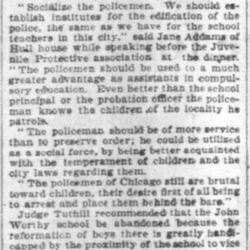 Addams writes Wald about Mary Smith's return to Chicago, Joseph Bowen's death, and the progress of the Chicago Child Welfare Exhibit. 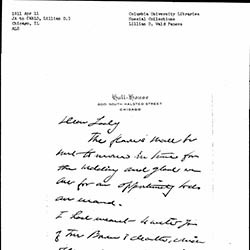 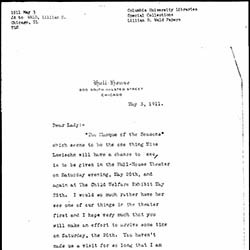 Addams invites Wald to visit Hull-House with Irene Lewisohn and discusses Mary Rozet Smith's health.